Not only the original movies, but the 2016 version of Ghostbusters was also filmed in New York City, and you can see sites from the film on the NYC TV & Movie Tour. Dr. Erin Gilbert (Kristen Wiig) is a professor at Columbia University. One day at work, she is approached by publisher Ed Mulgrave (Ed Begley, Jr.), who brings her old book about the existence of ghosts. Ed tries to convince her to explore the supposedly haunted Aldridge Mansion in New York City, but Erin, who has distanced herself from her past work, is hesitant. Erin is not proud of the book and it does not get better when she finds out that it has resurfaced because of her former friend and the book’s co-author Abby Yates (Melissa McCarthy) spreading it around. In an attempt of hiding the knowledge of the book, she decides to visit Abby in her lab. After a comedic interaction, they end up going to the Aldridge Mansion together. 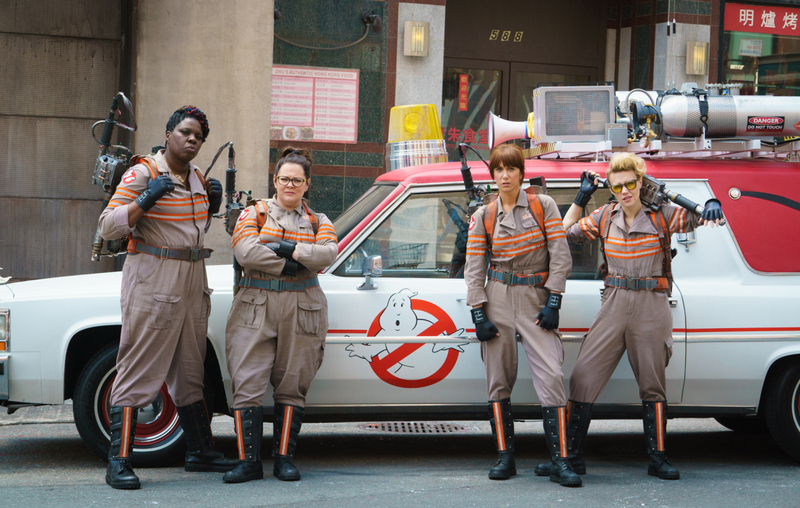 They later meet eccentric engineer Jillian Holtzmann (Kate McKinnon) and MTA subway employee Patty Tolan (Leslie Jones) to form a Ghostbusters team. Not to mention their secretary Kevin, brilliantly played by Chris Hemsworth in a smart flip of gender roles. The filming locations were actually split between New York City and Boston. Higgins Science Institute at Bronx Kuyper Middle School is where Abby has her lab in NYC. The real filming location is the Old Everett High School in Boston. Erin is a professor at Columbia University, which is in Upper Manhattan on the west side. Some shooting was done at the Alfred Lerner Hall, also known as the University’s’ “Glass House”. The famous firehouse from the original film is located in Tribeca and has a cameo in the 2016 film. You can get your own photo with the iconic filming location on the NYC TV & Movie Tour. The Ghostbusters’ new headquarters is above Kaze Shabu Shabu Restaurant, on 1 Harrison Ave, Boston. Fun fact: The scene with the big ghost invasion in New York City is actually a studio setup. They made a huge replica of Times Square in the old Naval Air Station in South Weymouth.